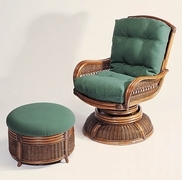 High Quality Rattan poles are combined with handwoven natural wicker to crate this comfirtable swivel rocker. For ultimate relazing just put your feet up on the optional matching ottoman. Pecan finish only. Over stuffed cushions are available in your choice of premiere fabrics. Sunbrella fabric available at an additional charge.